This recipe for the best-ever hot fudge sauce was lost for a while. I recently found the book it was in when I was cleaning out some things. It’s from The Joy of Chocolate by Judith Olney. I tried this recipe several years ago. It’s rich, dark, thick, slick, is quick to make and keeps easily in the refrigerator. Reheat it in the jar in the microwave for about 30 seconds, stir and serve. This sauce doesn’t break or separate when reheated as some sauces do. Several years ago I was no longer able to find the squares of unsweetened “baking chocolate” in the grocery store. 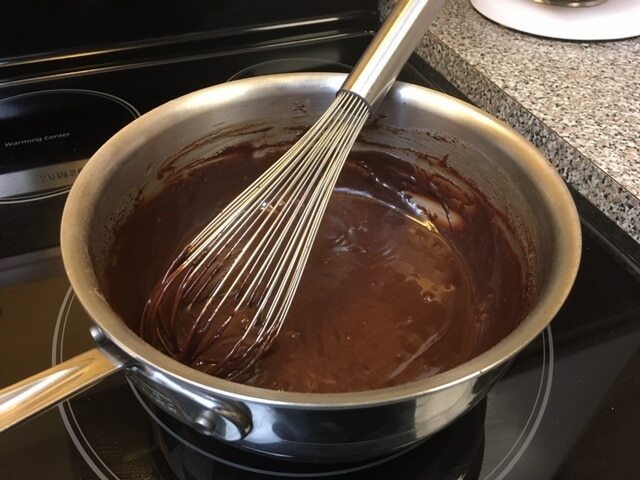 Then I found out that I could substitute 3 tablespoons of cocoa powder and 1 tablespoon of butter (or oil or shortening) for each 1-ounce square of unsweetened chocolate. This is one of those conversions I keep on a sheet taped to the inside of a kitchen cabinet. how rich do you want it? The original recipe called for evaporated milk, but I don’t particularly like the flavor of evaporated milk. I substituted half-and-half and it worked perfectly well. If you really want to make it rich, you can use heavy cream. best-ever hot fudge sauce is essential for turtle sundaes! We love Freddy’s frozen custard turtle sundaes. But we don’t always feel like getting in the car and driving out for them. I keep all of the parts on hand now and we can have them whenever we want. And maybe just a small scoop instead of an entire dish! I make our own vanilla ice cream; hot fudge sauce and caramel sauce in the refrigerator. Chop and toast pecans and keep them in an airtight container. Whipped cream and a cherry are optional! I’m happy to share recipes! I love to share recipes so everyone can enjoy the goodness. I also wanted to put this on our blog in case I misplace that cookbook again. At least I can go on our blog and find it! In a heavy saucepan, melt the butter. Remove from heat. 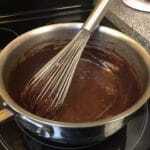 Add the cocoa powder and whisk until smooth. Stir in the sugar and cream. Whisk to blend completely. Bring sauce to a boil over medium heat, stirring constantly. Remove from heat as soon as it comes to a boil and whisk in the salt. Cool briefly. Stir in the vanilla.